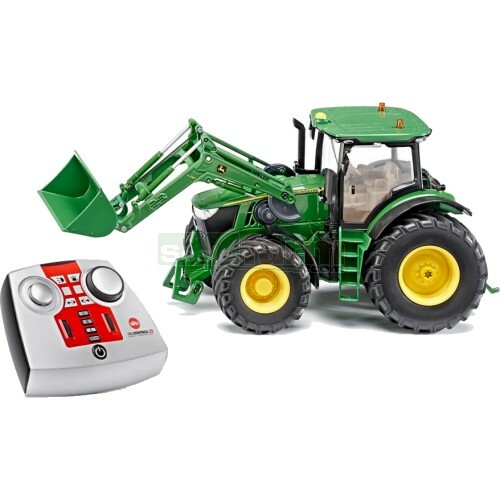 Die cast metal 2.4 GHz radio controlled John Deere 7R tractor with remote controlled frontloader and shovel. Proportionate steering and speed as well as a servo-powered rear coupling system. The model has 5 servo engines, with the shovel and frontloader rocker arm individually powered by two servos. Indicator functionality and separate right and left-hand steering. Universal lighting system with orange LEDs can be individually switched on and off. Supplied with 2.4 GHz remote control handset (SIKU 6708) which can control up to four vehicles via selectable channels. Tractor compatible with all SIKU remote control trailers. Tractor requires 3 x AAA batteries; remote control handset requires 4 x AA batteries, not included. Frontloader accessories SIKU 7070 and SIKU 3658 are not compatible.